How students’ ideas about “knowledge” and “knowing” mature over time. How DIT professors are helping students become more flexible problem-solvers. I’m happy to report that these topics are of interest to the engineering education community… DIT’s Gavin Duffy and I have already been invited to present our work in Greece this September and to publish an article in the Journal of Engineering Education. You can read more about the Fulbright in press releases by William and Mary and Hampton University. 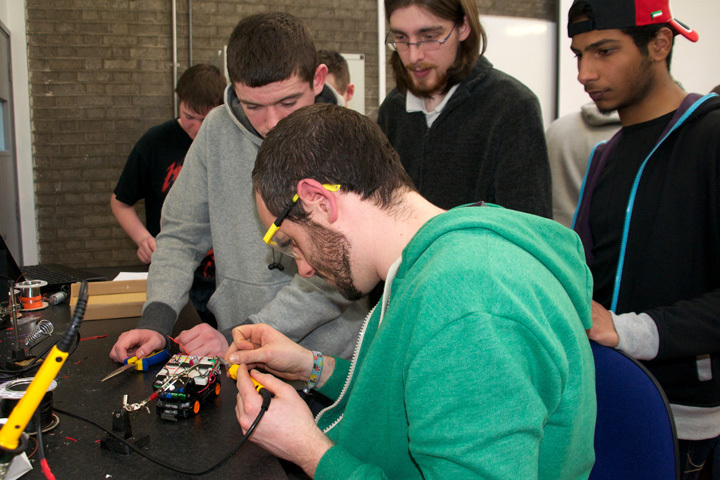 Electrical Engineering students prepare to compete in the mid-semester round of “Robo Sumo,” March 2012. ← Previous Post What is it?